Illuminated Exit Sign Site Topics: home seating theatre, home theater, home theatre decor, home theater furniture, home theatre design, movie poster, art deco, home cinema seating, exit signs, movie decor, movie popcorn and supplies, home theatre furnishings, home theater seats, theater chairs, etc! 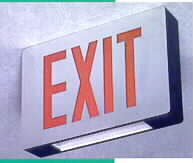 This Exit Sign can be back-mounted to a wall, or end-mounted to the ceiling or wall with special canopy (sold separately). A prismatic downlight lens creates a soft lighted area beneath the sign. The housing is die-cast aluminum with a Matte Black Frame. What's Always Glowing Above Every Theatre Door? That's Right....EXIT Signs! AC Operation With Two Incandescent 15-Wall Bulbs. A Downlight Lens Softly Illuminates The Area Below. Your Choice of Aluminum or Black Facing, And Red or Green Lettering. These Are The Same Fixtures Used In Commercial Theatres. Free Shipping and Discount Prices! Personalized Theatre Credit and Intro! Great Prices and Personalized Service! Copyright 2005-2007 Home Theatre Interiors.com All Rights Reserved.